RICHESON Signature Oil Set/12 In Wooden Box. 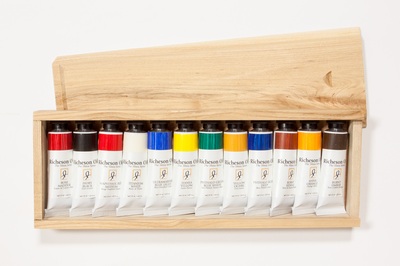 A set of 12 Richeson oil paints in a nice hardwood box. The set contains 12 1.25 ounce tubes which are stored in a nice wooden slide top box. The box is durable and will keep your paints protected and nicely stored when they are not in use. These oil paints are produced from the highest quality raw materials by Richeson, an expert in oil paint and art mediums. These oil paints are a great addition to your set of art mediums and come in the following colors: ivory black, titanium white, rose madder, yellow ochre, Shiva red medium, Shiva orange, Shiva blue deep, Shiva yellow light, Ultramarine blue light, burnt sienna, Shiva green, and burnt umber.